Identify key questions and Core Hypotheses in trait-based research. Identify data gaps that hinder the advancement of intra- and inter-disciplinary trait-based research. Coordinate the standardization of collection and curation of trait data. Build a model database to test explicit Core Hypotheses developed through TraitNet workshops. Facilitate the development of cross-disciplinary computational tools for merging, disseminating, and sharing trait data. 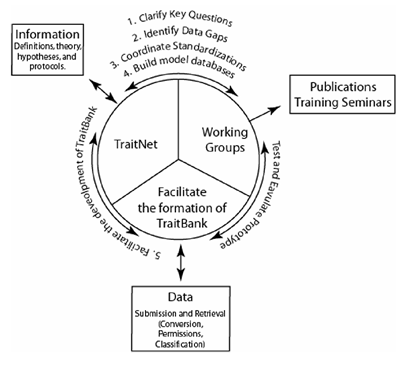 These activities will be structured around the design of a prototypical universal trait database, here referred to as TraitBank. It is important to note, however, that TraitNet itself, as an RCN, will not undertake to develop TraitBank, but rather lay the groundwork for such a facility. Participation is open to individuals/institutes interested in trait-based research and/or informatics.